Years ago, while struggling through some moldy tome at the Union library at Oxford, I happened to glance heavenward. It was more of an eye-roll than a divine supplication for studying aide, but it ended as a delightful distraction. 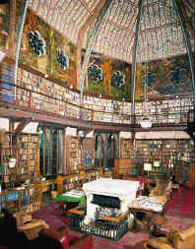 The timbered ceiling was ringed with paintings by the pre-Raphelites, and covered in a leafy vine pattern, courtesy of one William Morris. I'd never seen Morris' work in person before, and I wanted to find out more about him. A terrible, tiny picture of the Morris ceiling at the Oxford Union. Morris was a Renaissance man of sorts; an artist, poet, architect, and furniture and textile designer, he left a large body of work. 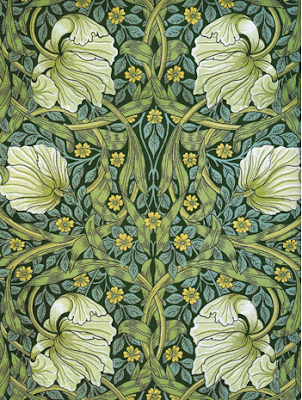 But he is most remembered for his marvelous bontanical-inspired fabric and wallpaper patterns, like the one below. Morris was highly enamored with tales of England's mythic past (Morte d'Arthur and others), but equally interested in making hand-made, quality objects affordable and available. 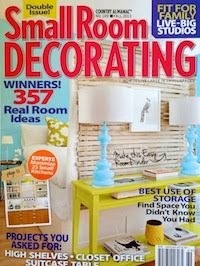 Most importantly to this blog, Morris wanted to elevate decorating to the level of the fine arts. ...and his influence is still apparent today. 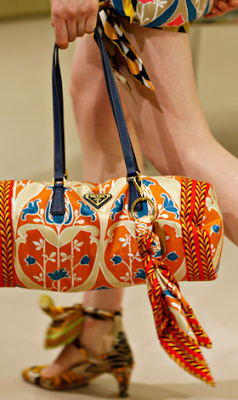 The moment I spotted Prada's carefree prints fluttering down the runway, I saw Morris inspiration! But Prada didn't copycat - in fact, this is a fun new blend of English library meets Palm Beach party. 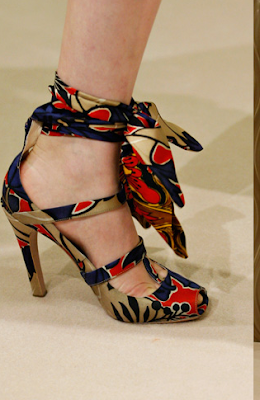 Here, a few Prada heels plus scarves, Spring 2010 collection. The scarf as handbag - even better, they still come with mini scarves! This bag is Morris in the middle and modern at the ends. A larger example of Morris-style pattern, beautifully draped. Prada's collection is an inspiring mix of traditional fabrics and modern styling. I doubt Morris would have paired neon pink and red, but I also think he'd approve. The over all effect is vaguely African - and very lovely. For more information about Morris work, and to see more samples of his botanical patterns, visit here. To purchase designs similar to those of Morris, click here. oh my gosh, such great finds!! Of course, I'm partial to the orange bag and tunic. But the shoes!!! Fantastic and like how you related it to Morris. I can definitely see Morris' influence in these Prada prints, which are drop dead gorgeous. Adore the scarf shoes! Really gorgeous and you are so right about the Morris influence. Just had to catch my breath after looking at those purses. Sigh and sigh again. Own some mastery of art nouveau, PRADA is cheaper than a building, right!